The theme for this month's Mixology Monday is perfect. Joel of the Southern Ash blog has challenged us to create perfect symmetry. Perfect symmetry is your theme this month! A “perfect” drink splits the liquor or liqueur evenly between two related ingredients. The most common “perfect” drink is a Perfect Manhattan where the vermouth is split between sweet and dry to create an altogether different experience. A perfect Old Fashioned splits the bourbon and rye are both used to create a singularly distinct experience. When done well, splitting the liquor lets each of the unique flavors and components of the shine through. Because they share a background, they don’t war with each other but instead you get both the mellow sweetness of the bourbon with the spicy backbone of the rye in that Old Fashioned… Why make a choice when you can have it all?! Your challenge is to create a new cocktail or explore an existing cocktail that splits the liquor or liqueur evenly in a “perfect” manner… Can you challenge yourself with gin and vodka in a light summer appropriate beverage? Perhaps you’ll delve deep into splitting Sambuca and ouzo in an anise-flavored digestive? Getting bored with tequila, maybe a perfect margarita with the backbone of mezcal will reawaken your appreciation? Campari too assertive for you? Maybe make a Perfect Negroni with Aperol lightening the weight. Let you imagination run wild! Took me a while to wrap my head around that job, but I went looking for a cocktail that would allow me to split all the ingredients and finally I picked one of my favorites: The Chartreuse Swizzle. I have previously fiddled a bit with this cocktail and figured I would give it another go. I decided to split the Chartreuse between Yellow and Green, and the Falernum between Velvet and Golden, the lime juice was split with lemon. Splitting the pinapple juice came down to what was freshly available at my local store, so I went for mango. Let me tell you fresh pineapple and fresh mango from a Danish chain store in October does not a lot of juice yield. Also since I still haven't got a real swizzle stick I went looking in the woodlands around my house and found a sprig of fir. Since it was still ozing sticky resin as I debarked it I suspect a bit of that ended up in my final drink. Add all of the ingredients to a tall glass of crushed ice, turning the swizzle stick between the palms of your hands give everything a good stir moving your hands up and down. 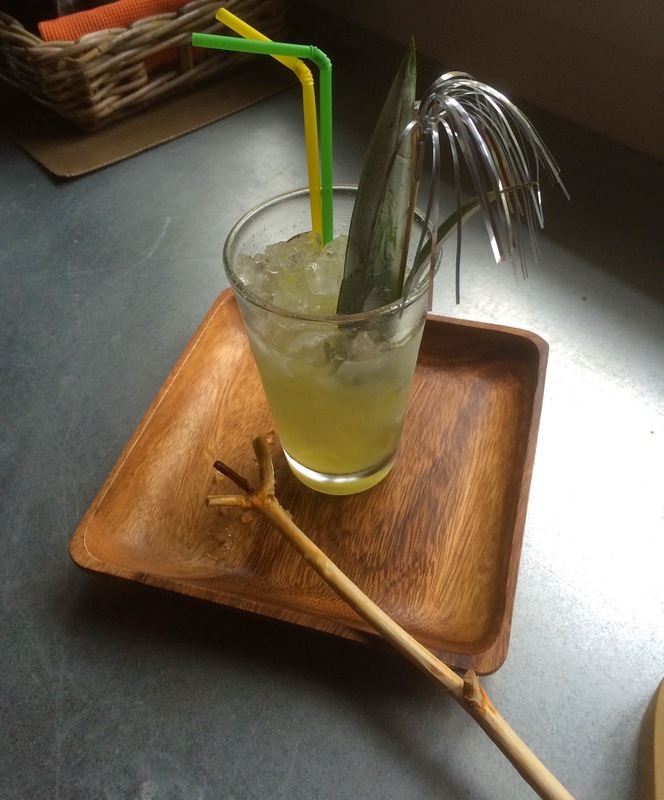 Garnish with a bit of pineapple top and enjoy a cool, refreshing taste of nature at it's finest.